Abstracted imagery evolves from recalled memories and experiences in this exhibition of mixed media paintings. “My current work (in some way, shape or form) has mostly been influenced by my personal experiences. My life experiences may appear in my work as vivid memories, as vague recollections, or as a visual abstraction of those things. Most of my recent works are done in mixed media on cradled wood panels. The hard surface of the panel is well suited for collage, medium transfer and other mixed media techniques that I have been working with for many years. I have recently been creating geometric abstract images inspired by personal experience combined with notionsabout the human figure, architecture and landscape. 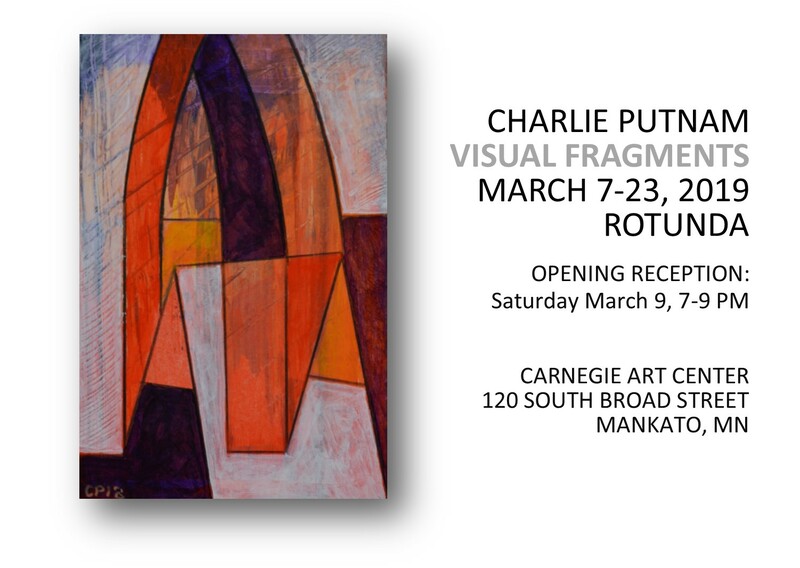 Painter and mixed media artist Charlie Putnam earned his Bachelor of Science, Art Education (1981), Bachelor of Fine Arts, Ceramics and Painting (1978), and Master of Arts (1984) from Minnesota State University, Mankato. He taught K-12 at LeSueur-Henderson (1985-2014) and was Adjunct Faculty in the Art Dept. at Minnesota State University (1988-2016). A recipient of several McKnight Individual Artist Grants, he was most recently the recipient of a 2018 McKnight Mid-Career Art Grant. He has exhibited extensively throughout the Midwest. Gallery and Gift Shop Hours are Thursdays, 1pm-7pm, Fridays 1pm-4pm and Saturdays 11am-5pm.